"Rocking and Rolling Through Montreal"
My friend and I were making a racecation out of this, so we drove up Friday afternoon. We were staying at a Holiday Inn in downtown Montreal that had been listed as one of the recommended hotels on the RnR website. This worked GREAT. We were about half a mile from the expo and right across from the metro station (which was free for all runners to use on race day!). Unfortunately for those registered for the full marathon in 2017, the weather did not decide to cooperate. Temps were forecasted to be around 85 on Sunday and Rock n Roll made the decision to cancel the full marathon. While I feel horrible for all the folks who spent months and months preparing to run 26.2 miles this past weekend, I do think this was the right decision. There was not a lot of shade out on that course and those are just brutal conditions to run a marathon in. Participants had the option to downgrade to the half marathon, transfer to a different Rock n Roll event, or get a full refund, which I think was a fair solution to a bad situation. EXPO: While I thought it was a good-quality expo with plenty of vendors, free samples, and opportunities for shopping, I knocked off a star because it was so darn hard to figure out where to go when you first entered the expo hall. A little more directional signage would have been nice. Even though neither my friend nor I spoke French, we had no issues communicating with anyone or figuring out where to go once in the expo. I didn’t know quite what to expect in terms of a language barrier, but thankfully we never had any problems. Race: I headed out to the train station around 6 am, wanting to be on the early side for the 7:30 start. Thankfully, there were plenty of other runners in the train station and I had zero issues figuring out where to go. I had to switch lines after a couple of stops on one train and when I got on the second train, I found myself standing right next to another Bibrave Pro, Bradley! It was great having a friend to chat with about running and other Rock n Roll races as we made our way to the start. As we climbed up onto the Jacques Cartier bridge where the race began, we got incredible views of the sunrise, the amusement park La Ronde, and all the corrals stretching out across the bridge! The only thing about starting on the bridge was that it made it logistically challenging to warm up. Most of the bridge was reserved for the corrals with a narrow driving lane on one side for police and race officials. There were plenty of porta-potties at the back end of the bridge (the only thing was that you had to hop over a jersey barrier to actually be able to access them). The race started right on time at 7:30 am, which I was very thankful for as you could already tell it was starting to get warm. Most of the course was very flat with very little shade apart from a couple of small but intense hills in the second half.There were tons of fire hydrants that the city had opened along the course so that runners could cool off by running through the spray - overall, I thought the city did a great job taking all the necessary precautions to keep the runners safe in the warm temperatures. They even had ice-water soaked towels at the finish which felt so nice! THE BLING: I loved the medal. It does a great job showing off the specific features of Montreal that you got to see along the course. Rock n Roll also allowed runners to vote on the design of the medal in the months leading up to the race which was pretty cool! The t-shirt was also very high quality - Brooks technical with female/male sizes. Definitely a shirt I will continue to wear during training runs! Overall, I was very impressed with the Rock and Roll experience. The bands along the course were frequent and added such a festive element to the race. While there were a few moments when I wished there had been somewhat better signage/direction, it was pretty dang smooth for a race with 10,000-ish runners. 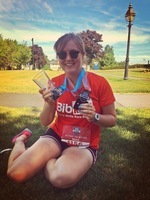 For an account of my personal experience at RnR Montreal, you can check out my race recap at https://2gensrunning.com/2017/09/26/rock-n-roll-montreal-race-recap/.